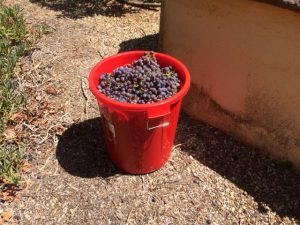 The Grape Harvest | Jean Roberts, author of "A Kiss Behind the Castanets"
Thanks to the heavy rains this winter we have had an absolute glut of fruit. We’ve given loads away, frozen heaps, eaten tons, but there’s only so many figs a body can eat, right? We had got to the stage when friends would run when they saw us coming with a carrier bag so we decided that we would have to try something different or they (the fruit, not the friends) would all have to go on the compost. So, after air and oven drying pears, making fig jam and chutney, and eating them in various forms of yogurt, I scoured the internet, begged recipes from friends, and set about making our own hooch. I made 2 types of pear vodka (one spicy, one sweet), preserved figs in brandy, and then cast a beady eye towards the grape vine. 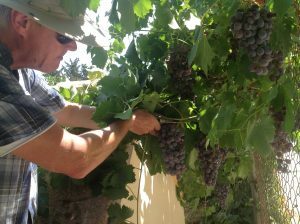 For the first time ever our grape vine was struggling under the weight of fat, succulent, pendulous clusters of juicy sweet black grapes. It was crying ‘help me!’ every time we passed by. So, buoyed up with the knowledge gained from our trip to the Rioja region earlier this year we decided to have a go at making our own wine. 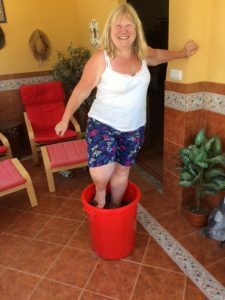 We bought a big red bucket and set out early before the sun got too hot chopping off the ones in the camino before setting about the garden. We filled a 25 litre bucket! Within minutes it was wheelbarrowed into the house to be trod. Yes! a bare footed stomp to extract every ounce of juicy sweetness. My mum would have had so much fun with this. I was chuckling at the memory of her laughing as the grape skins squelched between my toes and I sank lower and lower into the bucket. It was as much fun as you thought it would be mum. Right now it’s fizzing and popping away in the bucket and smelling absolutely wonderful! I wonder if the family will be brave enough to try it at Christmas. So looking forward to reading your book Jean. Thoroughly enjoyed what I have read so far. Very interesting and very amusing. This looks like a book that is going to have plenty to laugh at and at the same time tell a lot about the Spanish scene in general. Looking forward to reading more of Jean’s adventures.